theAd>> At Diaper Designs we create adorable and unique diaper cakes for your next baby event! What is a diaper cake? Only the hottest new trend in baby shower gifts and centerpieces! 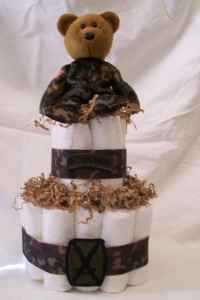 A diaper cake is a tower of individually rolled disposable diapers arranged to look like a cake. 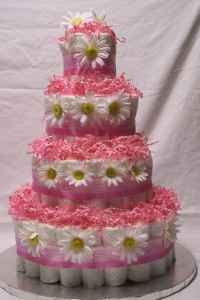 The cake is then decorated with ribbon, flowers and other items. Baby products can also be hidden inside or attached to the outside, depending on the style of cake you select. Everything on the cake is 100% usable, including the diapers! Choose from one of our 3 or 4 tier cakes for an impressive centerpiece, or one of our 2 tier mini cakes to take as a gift to the hospital. We have a variety of designs available, or special orders can be made upon request. Two great tastes that go great together! Cake and diapers! Why didn't I think if this? HMMM, special order....You know, my 89 year old Great Aunt's Birthday is just around the corner.